Define mass and discuss its relationship to gravity and center of gravity. 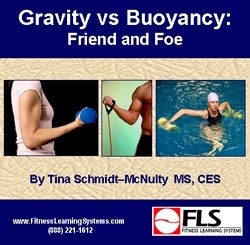 Define density and discuss its relationship to buoyancy and center of buoyancy. Identify other forms of resistance in a fluid environment. Identify joint motions and apply different forms of resistance to land and water exercise. Learn several exercises using resistance in land and water exercise.